A number of low pressure systems moving across the United States will come together off the Mid-Atlantic coast starting on Thursday night. The system will end up dumping over a foot of snow to our north and east, with some areas of New England and Boston seeing upwards of two feet snow. 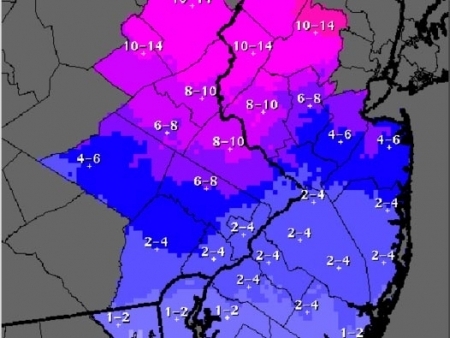 The Philadelphia area will see a mix of rain and snow Thursday night. Friday, the city should see mostly heavy rain, before changing to snow Friday night into Saturday morning. 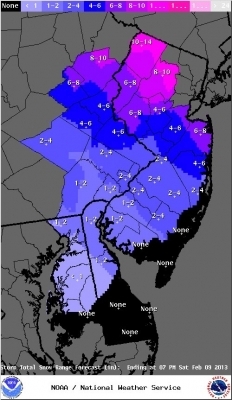 At this time, our area could see 2-4" of snow with more furtherer north and east. A man was shot by SEPTA police at 69th Street Terminal at 8 pm tonight. The 55-year-old man pulled out a knife in front of two officers who were on patrol. They ordered the man to drop the knife, who instead lunged at the officer. They fired at him, hitting him in the shoulder and side. The man is being treated at the hospital. There were hundreds of commuters in the terminal at the time of the incident. 69th Street remains closed during the investigation, shuttles are taking people between 69th and 63rd Street. The Gloucester County Prosecutor's Office is turning over the prosecution of the two brothers accused of killing 12-year-old Autumn Pasquale to Camden County. Gloucester County is making the move because the family of Autumn Pasquale plans to sue that office over how it handled the search for their missing daughter. Autumn disappeared Oct 20 from her home and her body was found nearby in a recycling container two days later. Two juvenile brothers have been arrested for her murder and are expected to be charged as a adults. It was also announced today that Autumn's mother, Jennifer Cornwell, has filed suit against her father, Anthony Pasquale, over control of a $100,000 memorial fund set up in her name.